“licensed producer” means a person who is authorized by a licence issued under the Cannabis Act (Canada) to produce cannabis for commercial purposes. (g) a person who is deemed under subsection (2) or (3) to be an affiliate of the person or an affiliate of an affiliate of the person. (b) having a fair market value, including a premium for control if applicable, of at least 50 per cent of the fair market value of all the issued and outstanding shares of the corporation. 1. An offence under the Act. 2. An offence under section 6, 7, 8, 8.1, 13 or 15 of the Cannabis Control Act, 2017 or, before the day on which section 1 of Schedule 1 to the Cannabis Statute Law Amendment Act, 2018 came into force, the Cannabis Act, 2017. 3. An offence under Division 1 of Part 1 of the Cannabis Act (Canada). 1. Sections 6, 7, 8, 8.1, 13 and 15 of the Cannabis Control Act, 2017 or, before the day on which section 1 of Schedule 1 to the Cannabis Statute Law Amendment Act, 2018 came into force, the Cannabis Act, 2017. 2. Sections 8, 9, 10, 11, 12, 13 and 14 of the Cannabis Act (Canada). 5. Sections 4, 5, 7 and 7.1 of the Controlled Drugs and Substances Act (Canada) are prescribed for the purposes of subsections 3 (6) and 5 (5) of the Act. 1. The person is in default of filing a return under a tax statute administered and enforced by the government of Ontario, or of paying any tax, penalty or interest assessed under any such statute for which payment arrangements have not been made. 2. If the person has a business number with the Canada Revenue Agency, the person is in default of filing a return under the Taxation Act, 2007, the Income Tax Act (Canada), Part IX of the Excise Tax Act (Canada) or an Act of another province or territory that imposes a tax on corporations and is administered and enforced by the Canada Revenue Agency. 7. A corporation is not eligible to be issued a retail operator licence if more than 9.9 per cent of the corporation is owned or controlled, directly or indirectly, by one or more licensed producers or their affiliates. 8. A person is not eligible to be issued a licence or authorization under the Act if the person is or has been a member of a criminal organization as defined in subsection 467.1 (1) of the Criminal Code (Canada), or is or has been involved in, or contributes or has contributed to, the activities of such an organization. (b) the premises at which the cannabis to be sold in the store would be received or stored would be accessible to any other commercial establishment or activity or to the public. 1. Protecting public health and safety. 2. Protecting youth and restricting their access to cannabis. 3. Preventing illicit activities in relation to cannabis. “private school” means a private school as defined in the Education Act. 1. If the school or private school is the primary or only occupant of a building, 150 metres shall be measured from the property line of the property on which the school or private school is located. 2. If the school or private school is not the primary or only occupant of a building, 150 meters shall be measured from the boundary of any space occupied by the school or private school within the building. (b) it only offers classes through the Internet. (b) the applicant and its affiliates between them already hold 75 retail store authorizations. 13. It is a condition of a retail store authorization that the holder display the authorization in a conspicuous place in the cannabis retail store. 14. (1) It is a condition of a retail store authorization that the holder not enter into contracts or agreements with any person or entity for the provision of cannabis distribution services. (b) a contract of employment with the holder to work in a cannabis retail store. 15. For the purposes of clause 11 (3) (c) of the Act, section 9 of the Cannabis Act (Canada) is prescribed. 16. (1) If a retail store authorization is suspended, the holder shall prominently display a sign respecting the suspension in a conspicuous place that is visible from the exterior of the public entrance to the cannabis retail store. (2) The sign referred to in subsection (1) shall be in the form approved by the Registrar and shall be displayed for the duration of the suspension. 17. A cannabis retail store is authorized to be open to the public between 9:00 a.m. and 11:00 p.m. on any day. 1. Cannabis accessories within the meaning of subsection 2 (1) of the Cannabis Act (Canada). 19. (1) For the purposes of subsection 7 (2) of the Act, the holder of a retail store authorization shall, in accordance with this section, prominently display the cannabis retail seal set out in Schedule 1 to this Regulation. (2) The cannabis retail seal shall be displayed in a conspicuous place that is visible from the exterior of the public entrance to the cannabis retail store. (3) The displayed cannabis retail seal shall be at least 17 centimetres in width at its widest point by 20 centimetres in height. (4) Either the French version, the English version or both versions of the cannabis retail seal may be displayed. (5) The holder of a retail store authorization that is revoked or fails to be renewed shall ensure that the cannabis retail seal is removed from display as soon as practicable after the revocation or non-renewal. 20. (1) The holder of a retail store authorization shall ensure that no individual who appears to be under 25 years of age is permitted to enter the cannabis retail store unless the holder or an employee of the holder has required the individual to provide a form of identification prescribed for the purposes of subsection 7 (2) of the Cannabis Control Act, 2017 and the holder or employee is satisfied that the individual is at least 19 years of age. (2) For the purposes of subsection (1), subsection 7 (3) of the Cannabis Control Act, 2017 applies with necessary modifications. (c) measures required to be taken under the Act to reduce the risk of cannabis being diverted to an illicit market or activity. 1. Holders of a retail store authorization. 2. Holders of a cannabis retail manager licence. 3. Individuals employed to work in a cannabis retail store. (3) The holder of a retail store authorization shall ensure that every holder of a cannabis retail manager licence or other individual employed to work in the cannabis retail store meets the requirements of subsection (2). 22. (1) For the purposes of subsection 41 (5) of the Act, a municipality shall provide to the Registrar written notice of a resolution passed under that section no later than three business days after the resolution is passed. (2) Despite subsection (1), notice of a resolution referred to in subsection 41 (1) of the Act shall not be provided to the Registrar later than January 22, 2019. 23. For the purposes of subsection 43 (5) of the Act, a council of the band shall as soon as practicable after the passing of a resolution referred to in that section provide to the Registrar written notice of the resolution. 24. This Regulation comes into force on the later of the day clause 49 (1) (a) of Schedule 2 to the Cannabis Statute Law Amendment Act, 2018 comes into force and the day this Regulation is filed. 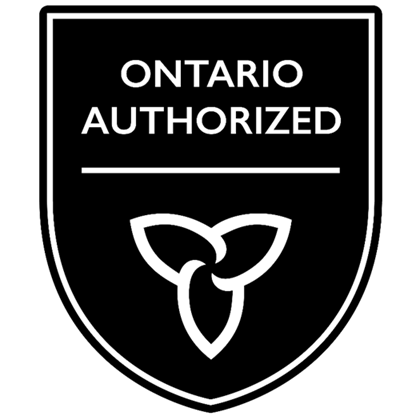 Text alternative: Illustration of English cannabis retail seal consisting of “ONTARIO AUTHORIZED” in white capitalized text, above a white horizontal line, above an illustration of a white trillium, on a black background with a white border. This text alternative is provided for convenience only and does not form part of the official law. 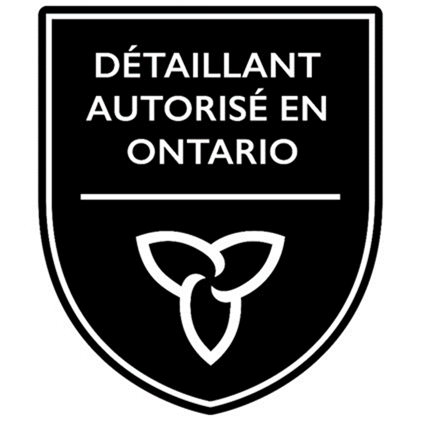 Text alternative: Illustration of French cannabis retail seal consisting of “DÉTAILLANT AUTORISÉ EN ONTARIO” in white capitalized text, above a white horizontal line, above an illustration of a white trillium, on a black background with a white border. This text alternative is provided for convenience only and does not form part of the official law.